It's day one of the ANZAC long weekend and it's dreary old weather. However it's good weather for keeping indoors and making, creating and eating home cooked pizza. The chickens have been hard at work and we have about 12 nice fresh eggs in the fridge. The kitchen aid is calling their name. It's time for tea and cake! The winner of last weeks giveaway for the little 'bundle' fawn is Kelly Leigh. She's a big foodie fan and you can read about her grilled cheese misgivings here. Now for a little taste of BrisStyle goodness with some handmade tea and cake items. We will be at the BrisStyle indie Twilight Market this week! Friday 30 May form 5pm in King George Square. Very excited about these markets, my Mum is also popping in from Far North Queensland to give me a hand. 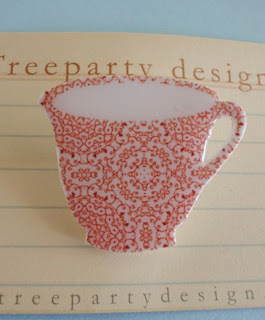 Teacup brooch by Tree Party Designs !!! Can't wait to stop by the markets after work - a very nice way to end the week indeed! 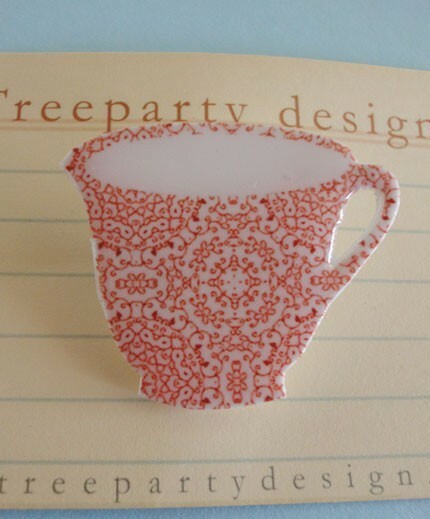 loving everything in the tree party designs shop! Hope everything goes well Friday! Hope your weekend is very special .. it's always strange to realize we are heading into Spring and Summer ~ and you are doing the opposite! What a great idea, getting excited about Twilight Markets now! Got the kiln firing up as we speak. Looking forward to the markets next weekend! Thanks for the reminder about the markets. I have never been before but am very keen. Cute badge designs. Old childrens books are so beautiful so I am glad you have found a way to re-use them. Great to connect with other Brisbanites too. I love all the things in your etsy shop! 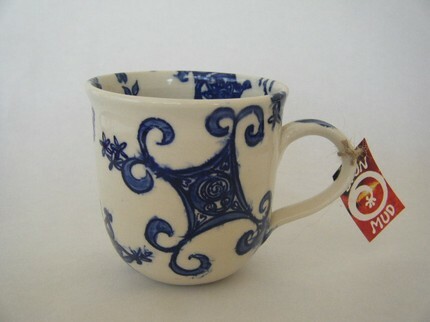 Love Love your blog, everything is so cute and quaint! yayy for ansac day weekend! 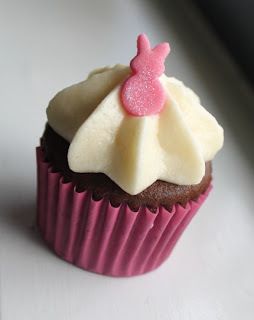 that bunny rabbit cake topper is ammmmaazzzzingggg. Loveeeeeeeee making cuppy cakes AND eating them! 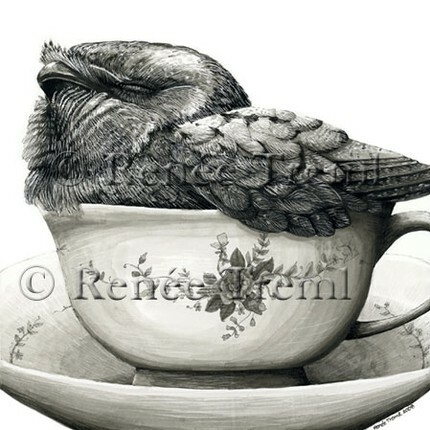 such a wonderful blog and etsy shop. so much eye candy inspiration! Ah I just wanted to say a HUGE thank you! The little deer brooch arrived in my mail box today (actually it came through the door and I had to chase my puppy around to get it - I think she wanted to wear it too!) It is even cuter in real life. And I love the way you packaged it in a jungle book envelope. It was such a pleasant surprise and it made my day extra special. Thanks again! Thanks for including me on your beautiful blog! I love your work and wear my bird brooch all the time. Look forward to seeing you at future markets!